Home Let’s not go again? ‘Mamma Mia: Here We Go Again’ feels like Hollywood producers rummaged through the fridge that is ABBA’s music and tried to make a dish out of leftovers. Some of those leftovers are decent, most are soggy. But even when the filmmakers revisit old tried and trues- Mamma Mia, Dancing Queen- they’ve lost their zest. Without Meryl Streep, how could we expect any different? Early on in this sequel/prequel to the 2008 film, we learn that Donna (played by Streep) has died (for the record, there is no explanation as to how). Her daughter, Sophie has reopened her seaside hotel on the Greek Island of Kalokairi in Donna’s honour. Like the first film, where the plot oriented around Sophie’s wedding and the budding question of which of her three fathers will walk her down the aisle, the second film also orients itself around another big event: the unveiling of the Bella Donna Hotel. But years later, the suspense-building question that drove the action of first film and the escalating triangle of tensions between Donna, her three long-lost lovers, and her daughter Sophie has been replaced by a much less stirring plot: flashback scenes to Donna’s post college graduation escapade through Europe. As Donna’s friends and family cope with her death in a seriousness that feels distant from the gaiety of the first film, we see the chronicles of Donna’s three love affairs- the blonde Swedish boater, Bill; the awkward alternative rocker Brit, Harry; and her ultimate love interest, the charming, Sam. ‘Mamma Mia: Here We Go Again’ features a mix of less remarkable ABBA songs blended with anthems from the first iteration of the Broadway play-turned-blockbuster. The result is dismal, with barely half the energy of the original hit. Where the energy does pop up is in the disposition of Lily James, who plays young Donna, a soul-searching, frivolous young graduate. But her vivacious nature and propensity for shrieking feels a far cry from the more measured performance of Streep in the first film. But, fear not- the movie is not missing all its stardom. As if to toss in one household name for another, the producers threw in Cher, playing as Donna’s mother, which is not just illogical- Donna says her mother is dead and a staunch catholic in the first film- but actively ruins any sort of flow in the plot. Cher is three years older than Streep- making this already implausible role decidedly absurd. She arrives at the opening party by chopper, wearing a sparkling suit, like a martian deployed from a UFO. Her rigid posture and language is a stark and unwelcome contrast to the ebb and flow of the ocean tides and parallel attitude of other major characters. The green screen looks as old as Cher’s music. From the moment of her industrial-militaristic arrival, the plot deconstructs into surreal oblivion. If the musical composition in ‘Mamma Mia’ is a stew made of leftovers, Cher as Donna (Streep)’s mother is substituting salt for sugar in a recipe. Sequels are always a tough go around, catering more to the pockets of Hollywood than fans of the original. This one is particularly rough. You eliminate the tour-de-force that is Meryl Streep, you scrounge through the 80s Swedish pop music for any gems that haven’t already been used, and all for a film about Americans prancing around on an Greek island, with no regard for the local history or implications of their tourism. What could go wrong? 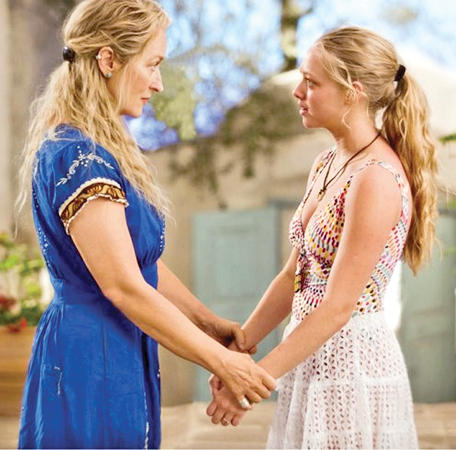 Mamma Mia treats female sexuality with an easy, subtle acceptance. It doesn’t cry out female empowerment in an activist-y way, but with casual references to female desire. Largely courtesy of Tanya, one of Donna’s best friends, who delivers a handful of show-stopping sexual comments with nonchalance and simple confidence, an intergenerational reckoning with sexuality is treated with levity and grace. Much like the first film, in ‘Mamma Mia: Here We Go Again’, women are at the center- female friendships, a mother-daughter relationship, and women, of all ages are active, plot-driving characters. Serious subject matter underlies the pop anthems and sprawling seascapes, but it feels natural-- like maybe, for a second, we do live in a world where women drive the plot and expressions of female sexuality are not threatening or taboo. To praise the film offers for its female sexual empowerment, would be to overlook all that it lacks by way of sexual, ethnic, and cultural diversity. For a film made in 2018, it’s lack of self awareness, heteronormative tendencies, and all-white cast feels like it’s more contemporaneous with the traditional garb the Greek locals in the film are wearing. 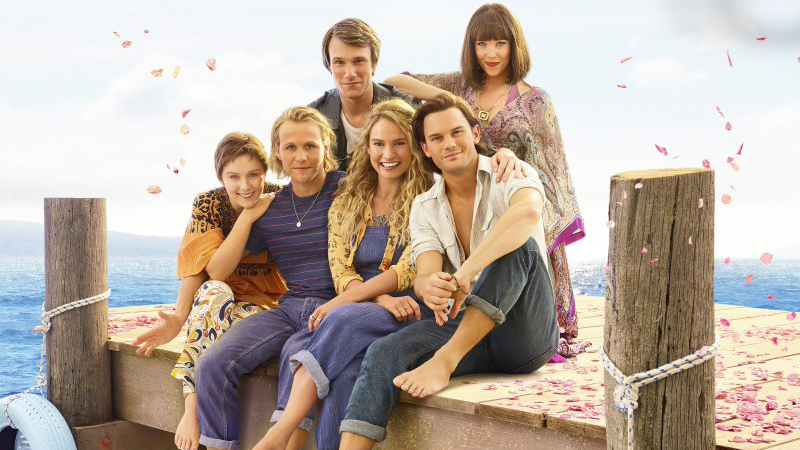 Producer, Judy Craymer reportedly said, “Mamma Mia! makes people comfortable in their own skin,” but it’s worth asking, what people, specifically? Throughout the film, sexual empowerment is really only afforded to white, American characters. There are a sprinkling of people of color, one black female accordion player makes an appearance in scene where a Donna ultimately takes over the stage with a rendition of the song, Mamma Mia. Greeks remain in the background, speaking so few lines you could count them on one hand. They wear antiquated Greek clothes, as if frozen in time. Nothing more than pieces of the setting, they function like souvenirs of an intercontinental “find yourself” conquest. For a film that features a bunch of Americans dancing to Swedish pop music, on a Greek island (that was actually filmed in Croatia), it is strikingly myopic and geographically neutral. There is just one, albeit subtle, allusion to the current economic turmoil plaguing contemporary Greece. A fisherman says he and his fellow fishers have been feeling low because they are struggling financially. Bill, one of Sophie’s dads, invites them to a party and their worries seem to disappear into thin air. It is a glimmer of self awareness in an otherwise blissfully ignorant film. Donna is an exemplar of the “find yourself” trope at the heart of much of Western tourism. She comes to an island and claims it as her own, indulging in the beauty of it (One thing you could not count on a single hand is how many times she babbles about this beautiful place! ), but with little regard for the people and history. All it would have taken was one little scene with one of the many Greek waiters or her landlady who generously and unbelievably gave her a farmhouse for free (so long as she makes it beautiful!). But instead, we got a display of American tourism at its most ignorant and unaware to the tune of Swedish pop music. The film was fun, but it’s 2018, you would think Hollywood would be a bit more thoughtful by now.